It’s been a tough year for a lot of people including Santa. The BIG guy has seen a lot of changes at the North Pole. Elf layoffs top the list with the out -sourcing of toy manufacturing going to China. The effect of that is that the GNP (Gifts from the North Pole) is running way behind the output from last year. Mail was way down too. No need for so many elves to open as many “Dear Santa” letters anymore; kids just text him now. He’s trying to adjust to that. Santa’s reindeers faired no better with Rudolph and his iconic red nose replaced by a GPS system. And with the sleigh running off an electrical charge, Donner and Blixen are looking for work too. Mrs. Claus is economizing too by repairing Santa’s old suit from last Christmas instead of making him a new one. She told him he had to tighten his belt. Once the sleigh is loaded and Mrs. Claus waves him off on his long nighttime journey, he’ll face other bums in the sky as well. As soon as he lands, he’ll need his passport or some other form of identification before he even thinks of going down a chimney. The TSA (Temporary Santa Association) has been notified that he is on his way and they are ready to pat him down the minute his bulging body hits the living room floor. His sack will go through the x-ray machine set up especially for him at every stop. He’ll still have to remove his belt, boots, hat, coat, gloves and suspenders. Once cleared, the jolly ol’ man can leave those much dreamed about toys and munch on sugar cookies made just for him. When his work is finally done, he’ll take to the sky again (but not before going back through security) and wish a Ho! Ho! Ho Merry Christmas to all and to all a good night! Cream butter and sugar in large bowl until light and fluffy. Beat in the egg and vanilla extract. In a medium sized bowl, sift the flour, baking powder and salt together. Add flour mixture to the butter mixture and combine well until a dough forms. Gather dough into a ball and flatten it into a round disk; wrap dough in wax paper and refrigerate it at least an hour or overnight. Line baking sheets with parchment paper. Roll dough out to desired thickness and cut using your favorite cookie cutters. Transfer the cutouts to a baking sheet with a metal spatula. S0pace them at least 1 inch apart. Bake for 8-10 minutes or until cookies are firm to the touch bust still pale. Let cookies cool completely before frosting. 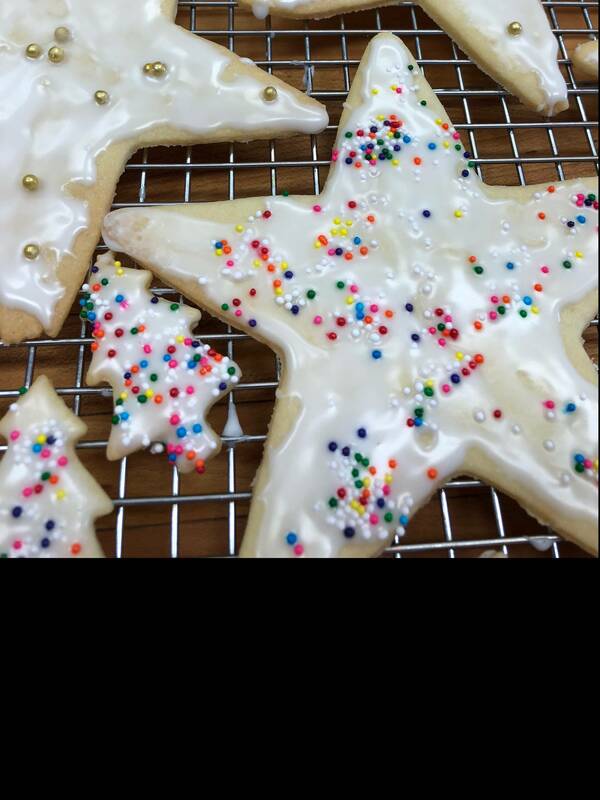 Frost with your favorite frosting or glaze; let the cookies dry completely.